As part of our 20-year commitment to always be innovative, trend setters and on the cutting-edge of new technologies, 30 Minute Photos Etc. and ScanMyPhotos.com announces the launch of an entirely new photo retail experience. We call it The KODAK Experience and it is eco-friendly and chemical free. No more film developing or chemicals, thanks to KODAK's new APEX retail printing solution. The KODAK Experience is modern, smart and boasts extraordinary color and professional quality photo products that you have come to expect from Kodak," explained Mitch Goldstone, president and CEO of ScanMYPhotos.com and 30 Minute Photos Etc. Photography has been redefined by integrating a new way to make photographic pictures and 100s of other custom photo products. It leverages proven KODAK technology to maximize the customer experience and is efficient and eco-friendly. The new printing solutions are showcased at 30 Minute Photos Etc. and ScanMyPhotos.com at their retail photo center in southern California. Click here for directions and more info. Using banks of KODAK Picture Kiosks and installing KODAK Adaptive Picture Exchange (APEX) thermal dry lab systems as our new in-store photofinishing service is more cost effective and creates a more sustainable retail environment, while allowing our customers to enjoy top-of-the-line premium KODAK print and photo creation products. KODAK's Multi-Station Kiosk technology allows 30 Minute Photos Etc. [ScanMyPhotos.com] to maximize the consumer experience. KODAK's APEX dry lab provides a scalable and modular photo processing solution. APEX requires less operating space than traditional Noritsu wet labs. Additionally, APEX is energy efficient, consuming 70 to 90 percent less energy than wet labs. The time required to activate, operat e and maintain the system is greatly reduced due to the elimination of processing chemicals, water and other supplies used in wet labs. Thanks to dry lab technology, APEX offers improved air quality and lower greenhouse gas emissions. Given the dramatically lower utility costs and the elimination of processing chemicals, APEX is among the most efficient and environmentally-conscious retail printing solutions on the market. "The new KODAK Experience Photo Centre showcases an ongoing commitment by 30 Minute Photos Etc. to deliver the best KODAK technology and new high-speed innovations to create an enjoyable and fun experience for consumers to do more with their pictures," said Goldstone. The in store KODAK kiosks are all linked to APEX to create instant photo products, including photo books, KODAK Picture Movie DVDs, prints from your camera phone, giant collage posters from your favorite snapshots and more. Much more. 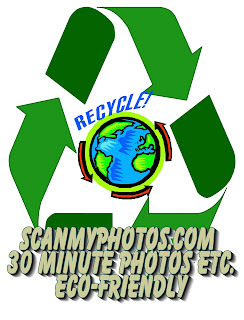 As an environmentally friendly photo centre, ScanMyPhotos.com [30 Minute Photos Etc.] invites you to visit today. The new retail environment is energy efficient from the ground up - from modern air conditioning to energy efficient lighting and an array of eco-friendly solutions that helps protect the environment. Bring lots of memory cards, shoeboxes of photo snapshots, a camera phone with saved pictures and your imagination. Then, get ready to have fun and revisit your favorite photo memories and make new o nes.